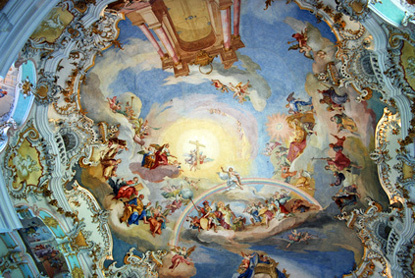 Trompe l'oeil ceiling, Wies Church, Steingaden. Steingaden is the site of the 12th-century Steingaden Abbey and the Wies Church. The latter is a masterpiece of rococo art featuring a white an gold interior with a resplendent trompe l'oeil ceiling. A major pilgrimage site in the 18th century, Wieskirche was added to the UNESCO World Heritage list. The Wies Church is open all year round, daily from 8:00 am to 7:00 pm (to 5:00 pm during winter time). Admission is free.